Are You Falling Behind on Tech? Over 90% of consumers are aware of smart home technology and over 75% are interested in building it into their homes. 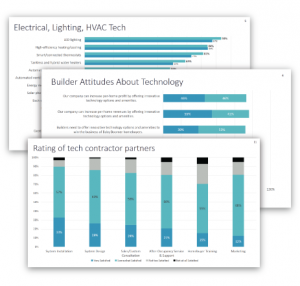 The TecHome Builder Summit is centered around helping you understand this growing demand from consumers. In fact, research suggests that you may miss out on 70% of the market if you do not integrate tech into your building portfolio. With such a rapid rate of change, it becomes incredibly important to keep up with current knowledge, end confusion, and take advantage of opportunities through this unique event. Connect with top industry leaders and build a network of lifelong colleagues. Enjoy a VIP experience with a custom event itinerary and complimentary accommodations. Improve and advance your current approach to developing home tech strategies. Join us December 5-7 at the Phoenix Convention Center for the 2018 TecHome Builder Summit. This personalized, unique hosted event experience is unlike any other. Designed to cater to your needs, TecHome Builder Summit will help you win as a builder providing the latest home technology standards, options, and amenities. This all-expense-paid executive experience connects you with other industry leaders at top high volume, luxury, and multifamily homebuilding companies.